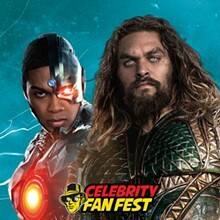 Celebrity Fan Fest is a two-day interactive fan festival filled with celebrity appearances, photo-ops, celebrity panels, special attractions and more. Actor Jason Momoa, star of the upcoming blockbuster 'Aquaman' will be headlining this year’s festival. Other celebrities including Ray Fisher, whom is known for his role as Cyborg in 'Justice League' and 'Batman v Superman: Dawn of Justice.' Celebrity Fan Fest will be announcing additional celebrity appearances in the coming weeks.